The 2013 Zoos and Aquariums: Committing to Conservation (ZACC) conference runs from July 8th—July 12th in Des Moines, Iowa, hosted by the Blank Park Zoo. 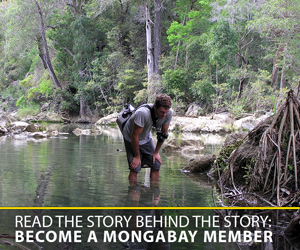 Ahead of the event, Mongabay.com is running a series of Q&As with presenters. For more interviews, please see our ZACC feed. Snow leopard. Photo by: Steve Winter/National Geographic. Tibetan monks could be the key to safeguarding the snow leopard (Panthera uncia) from extinction, according to an innovative program by big cat NGO Panthera which is partnering with Buddhist monasteries deep in leopard territory. Listed as Endangered by the IUCN Red List, snow leopard populations have dropped by a fifth in the last 16 years or so. Large, beautiful, and almost never-seen, snow leopards are the apex predators of the high plateaus and mountains of central Asia, but their survival like so many big predators is in jeopardy. Tom McCarthy the head of the Snow Leopard Program at Panthera told mongabay.com that the high-altitude predators are facing three major threats: poaching for illegal snow leopard skins, fur, and parts; decline in natural prey; and revenge killing by locals over livestock losses. 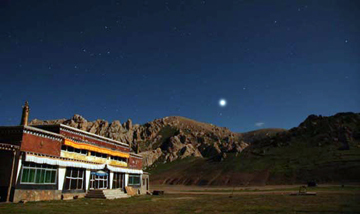 Soujia Monastery. Photo by: Panthera (B. Weckworth). To mitigate this conflict, Panthera has turned to Tibetan-Buddhist monasteries as allies. Inhabiting the same sky-high regions as snow leopards in China, Buddhist monks, who maintain a special status in the society, have become effective partners, working with local communities to mitigate conflict and killings while monitoring the cats’ status. Moreover, this program could be expanded across snow leopard habtiat. 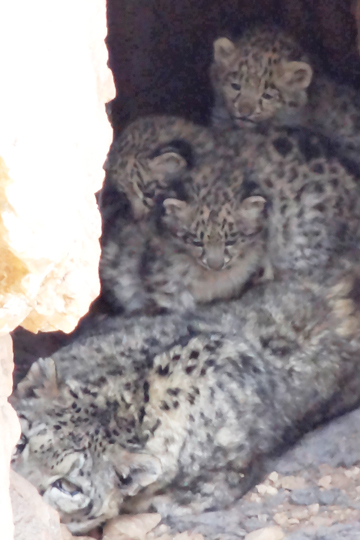 “As a strategy, monastery-based snow leopard conservation could be extended to other Tibetan Buddhist regions, covering about 80 percent of global snow leopard range,” explains Li Juan, who is the world’s first female scientist with a PhD in zoology focusing on snow leopards and is currently a post-doctoral student at Peking University. She has played a key role in the work on the Tibetan Plateau, which is a collaboration between the Chinese conservation NGO Shan Shui, Panthera and the Snow Leopard Trust. Tom McCarthy and Li Juan will be presenting on their work at the 2013 Zoos and Aquariums: Committing to Conservation (ZACC) conference on Tuesday, July 12th in Des Moines, Iowa. Tom McCarthy far left with monks in China. Photo by: Panthera (T. McCarthy). Tom McCarthy: I am a wildlife biologist and started my career in Alaska. I did my MSc on brown bear ecology and then worked with the Alaska Department of Fish and Game for several years as a research and management biologist. 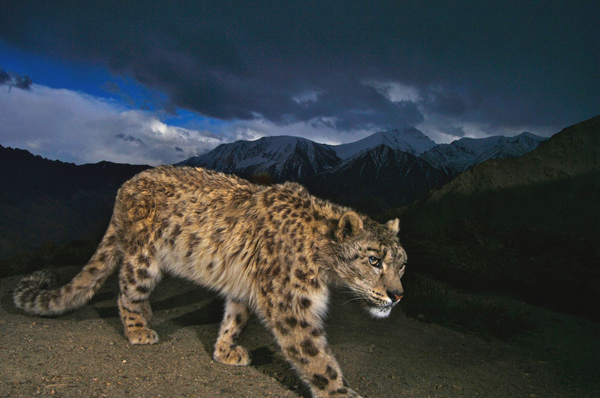 Mongabay: What drew you to snow leopards initially? Rare image of female snow leopard with cubs. Photo by: Panthera/Shan Shui (E. Zhu). Tom McCarthy: It was almost an accident. I had always wanted to work overseas, so when a friend from Alaska was going to Mongolia to film the work of George Schaller I sent a letter along asking if there was anything there I could get involved with. I was thinking one of George’s Asian bear studies. Many months later when the answer came back he said there was a snow leopard project in the Gobi that he needed someone to lead. I had never before even thought of doing snow leopard work, but that project became the basis for my PhD and started me on a 20-year career in this field. Mongabay: What are the major threats facing this species? Retribution killing for depredation on livestock. Snow leopards share their mountain habitat with poor herding families whose lives are highly dependent on livestock. When a snow leopard kills a sheep, goat, yak or even a young camel, it is a huge economic loss to the herder. It is hard to blame them for wanting to kill the snow leopard in retaliation. Loss of natural prey. Snow leopards subsist primarily on large wild mountain ungulates, like ibex, blue sheep, argali, and markhor. Many of those are in decline from poaching for food and sale of parts. In some cases poorly managed trophy hunting is also driving populations down, leaving the snow leopard with little choice but to shift attention to livestock, with the resultant conflict with herders. Poaching for hides and bones. Snow leopard hides, and more so their bones, are extremely valuable on the black market. A single set of snow leopard bones on the Traditional Asian Medical market can bring upwards of $10,000. Hides remain popular for fur garments, primarily in eastern Europe. Despite the fact they are protected legally in each of their 12 range countries, they are persecuted and hunted in many areas and populations may be in steep declines in some of those. Mongabay: You’ve partnered with Buddhist monasteries to help save these cryptic cats. Will you tell us how this partnership works? 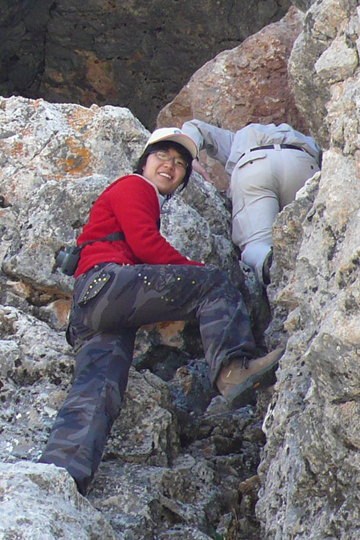 Li Juan climbing to snow leopard camera trap site. Photo by: Shan Shui (Li Juan). Li Juan: We have since 2009 initiated cooperative programs with four monasteries for snow leopard conservation in the Sanjiangyuan region. 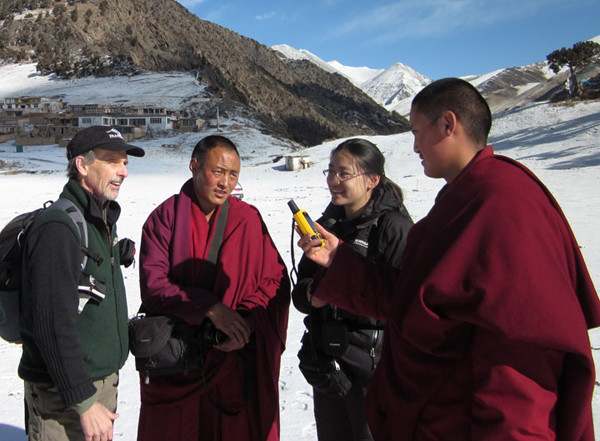 We provided funds for patrollers and for buying binoculars, cameras and GPSs, as well as training monks to observe, monitor, and record wildlife systematically. The Rinpoche, Khenpos, and other high-ranking monks were requested to emphasize the special value of snow leopards and other wildlife in their religious convocations. At the same time we distributed snow leopard posters to encourage conservation of this iconic cat. These programs have seen their initial effectiveness. Mongabay: How do the monks feel about the snow leopards? Li Juan: Actually, they do not have special feeling about snow leopards. In their view, they treat all beings as equal. Mongabay: How do the monasteries advocate with local communities for the leopards? Li Juan: The Rinpoche, Khenpos, and other high-ranking monks would emphasize the special value of snow leopards and other wildlife in their religious convocations. They also encourage the locals to swear an oath not to kill wildlife every year. When some herders complained about their severe loss of livestock to snow leopards, some Khenpos even pay their own money to compensate them. When they encountered Tibetans hunting wildlife, they might ask them to kneel and do penance, order them to leave, or report illegal activities to the local governments. Mongabay: What scientific duties do the Buddhist monks perform? Li Juan: The monks do the scientific monitoring routinely, including counting blue sheep, recording the wildlife they encountered, recording the plant phenology etc. Some monks work as our field assistants, help us with collecting feces and changing the batteries and cards of camera traps. They are very excited about the camera trapping and enjoy receiving and sharing the photos with their community. Mongabay: What is the research uncovering? Any surprises? Li Juan: We are surprised to find that more snow leopard habitats in the Sanjiangyuan area could be directly protected by monasteries than the core areas of the Sanjiangyuan National Nature Reserve. Tibetan monasteries have similar habitat selection with snow leopards, both on the large and small scales. As a strategy, monastery-based snow leopard conservation could be extended to other Tibetan Buddhist regions, covering about 80 percent of global snow leopard range. 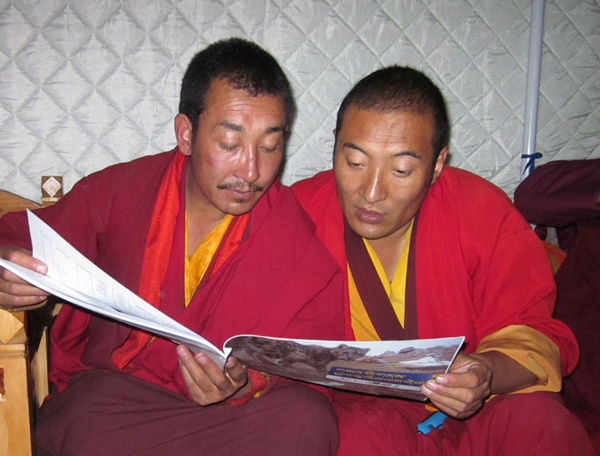 Monks reading snow leopard field guide. Photo by: Panthera (T. McCarthy). (05/22/2013) Prince Charles has warned that criminal gangs are turning to animal poaching, an unprecedented slaughter of species that can only be stopped by waging war on the perpetrators, in the latest of a series of increasingly outspoken speeches about the environment. Addressing a conference of conservationists at St James’s Palace in London, the Prince of Wales announced a meeting of heads of state to take place this autumn in London under government auspices to combat what he described as an emerging, militarized crisis. (01/03/2013) The trading of big cat pelts is nothing new, but recent demand for snow leopard pelts and taxidermy mounts has added a new commodity to the illegal trade in wildlife products, according to the Environmental Investigation Agency (EIA). Traditionally, the market for large cat products has centered around tiger bones and parts for traditional Chinese medicine. Snow leopards (Uncia uncia), however, are a novel trend in the illegal wildlife trade arena and skins and taxidermy mounts are the most recent fad in luxury home décor. (07/18/2012) Scientists have captured and collared two snow leopards (Panthera uncia), arguably one of the world’s most elusive predators, in Afghanistan for the first time. Undertaken by researchers with Wildlife Conservation Society (WCS) and Afghani vets, the successful operation was conducted as a new study finds that snow leopard habitat could shrink by nearly one-third due to anthropogenic climate change in the Himalayas.